These macarons are amazing! Dana's Bakery has taken the traditional French Macaron to a new level by creating uniquely American flavors inspired by classic desserts, pastries, candy and sweet treats! From Red Velvet to S'mores, Fruity Cereal, to Peanut Butter & Jelly, these all-American favorites are destined to please even the most discriminating! Choose from the 12 piece assortment that arrives in an adorable reusable insulated bag or wow them even further with the ribboned gift box in 3 sizes: 25pc, 50pc, or 100pc. Gluten free too! - made with almond flour. Makes a great gift for one or for a large party!Kosher, OU D.
These macarons are amazing! 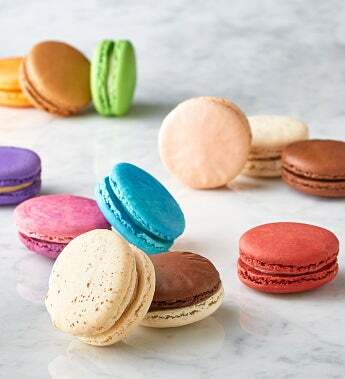 Dana`s Bakery has taken the traditional French Macaron to a new level by creating uniquely American flavors inspired by classic desserts, pastries, candy and sweet treats! From Red Velvet to S`mores, Fruity Cereal, to Peanut Butter & Jelly, these all-American favorites are destined to please even the most discriminating! Choose from four sizes. Gluten free too! - made with almond flour. Makes a great gift for one or for a large party! Kosher, OU D.